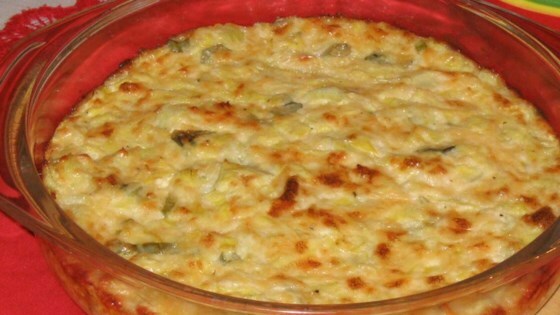 "This hot artichoke dip is the life of any party. Serve hot with celery, toasted bread or crackers." In a medium-sized mixing bowl, stir together mayonnaise, sour cream, Parmesan cheese and onion. When these ingredients are combined, mix in artichoke hearts, lemon juice, salt and pepper. Transfer mixture to a shallow baking dish. Bake at 400 degrees F (200 degrees C) for 20 minutes, or until light brown on top. Creamy artichoke dip that goes wonderfully with anything! I make this recipe with 1/2 cup parm. cheese and add in some cream cheese and swiss to make it creamy. I left out the onion and it was delicious. This stuff is great. I might try adding spinach next time I make it. This was an excellent pre-dinner treat. I liked the creamy, not too rich flavor. I would have liked to have a little more spice to it, but other than that it was excellent and well liked.